Before you begin submitting your business information to the major internet business directories, download our Intake form and complete it. This will make your process of submitting easier because all you have to do is copy and paste from your intake form. That’s how we do it for our clients. Below are a list of some common directories you’ll want to submit your business info to. I also like to use this method to find the most important directories. Search Google for what you do + zip code and submit to the directories you see on page 1 and 2 of the search results. Refer to this post for an example. As consistency of your structured citations in these business directories is listed as the 3rd most important ranking factor in search by local SEO experts, make sure your name, address, phone number and website are a consistent exact match on each of these directories. You’ll see this process is time consuming and if you want us to handle it for you, it’s part of our local SEO services. Call 503-890-6663 to learn more. Please note, the directories mentioned below are relevant as of August 2014. They change their interfaces and rules frequently and we also change our minds about which ones are important. A good way to get a strong, short list of important internet directories for your industry is to search in Google. Learn how in our post: Internet Marketing Tips For Your Business. What is an internet business directory? An internet business directory is an online version of the Yellow Pages directories we all used before the internet came into being. Why are they important? The directories on this list are all important because they commonly appear in search results. Google, Bing, and Yahoo have their own business listings which appear in local results. What’s a citation? A citation is any mention of your business’s name, address, and phone number – usually in a business directory. Support: https://support.google.com/places/?hl=en# and they will call you. Notes: If you want to appear in local search results, you have to have a Google Business page. View our tutorial that takes you step by step through how to claim and optimize your local Google Business page. Notes: Requires phone number verification. Support: mblm@acxiom.com or 866-750-5438. I received much better support via email. Notes: When first setting up your account password, be sure to include upper case, lower case, special character and no same letters in consecutive order. Otherwise your password will be rejected. Additionally, you will need to submit documentation to substantiate your listing. (See image below). Since my business is home-based, I was able to provide a utility bill with my name and address. After you submit, wait 30 days and then check back to ensure that your business is listed. Make sure to be logged out of Acxiom when you do this. Contact support at the email above if you have any issues. Agencies: Acxiom only allows you to create 5 business listings for free. After that, there’s a $50 charge. You can use a different email address, but Acxiom detects your IP address, so you’ll either have to switch your IP or enter the client information from a different computer to create a new account for your client. Aggregate Info: Acxiom gets its information about your business from local telephone directories. It is a major aggregator for this list of over 60 internet business directories. What this means is that each of the directories on the list get their information directly from Acxiom, and that’s why getting your business listed there is so important. Acxiom does not assign a specific URL like most internet business directories. Instead, I had to visit their website and search for my business by phone number. The image above is confirmation that my business has been successfully submitted to Acxiom. Notes: I also want to know if, as an agency, I’ll be able to submit and claim multiple buesinesses using my credentials. Also, who are they an aggregate for? Info to come. Notes: As of 2012, if your business isn’t already listed in the Neustar/LocalEze database, you have two options to add it (1) you can pay $297 or (2) you can wait. LocalEze tech support told me they regularly scan and add new businesses from yellow page and white page listings (the books). They do not pull data from any other online source. While LocalEze will not commit to how often they do this, they did say it’s reasonable to expect to see your business in their directory within 6-12 months from the time your business is listed in your local yellow/white pages. Once your business is listed, claim it as an “Unsubscribed” listing – this is the free way to do it. You’ll be allowed to make one change per calendar year, so make sure your business name, address and phone number exactly match what is on your website. Neustar/LocalEze is an important aggregator that claims to update to over 150 other internet business directories including Yahoo Local, Bing Local, MapQuest, 411.com and others. A basic (free) listing does not include a link to your website and may only be modified once a year. To add website, additional categories, and more, you’ll need to upgrade to a premium listing which costs $297/year. Notes: Since Google refreshed it’s algorithm in late 2013, Yelp appears high in many local searches. For right now, it’s one of the most important places to be listed, especially for people who skip Google and use Yelp to find a local business. Notes: You need to login (if you already have an account) or create an account to manage your listing. 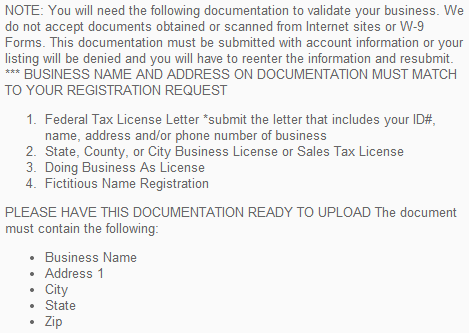 Enter all your business information when prompted and YP will prompt you with existing listings to claim. You’ll need to call them to delete any old or outdated listings. All changes need to be verified by phone with the business owner. Notes: As of 1-28-14, you have to call them to change your categories, if you listed them incorrectly. CityGrid FAQ with additional support. Notes: Here’s our step-by-step guide to submitting your local business to the BBB. Their ratings system is explained here. Even though non-accredited businesses do not receive a link back to their site, listing your business with the BBB is still a valuable citation.